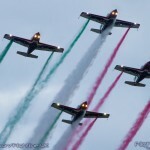 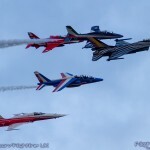 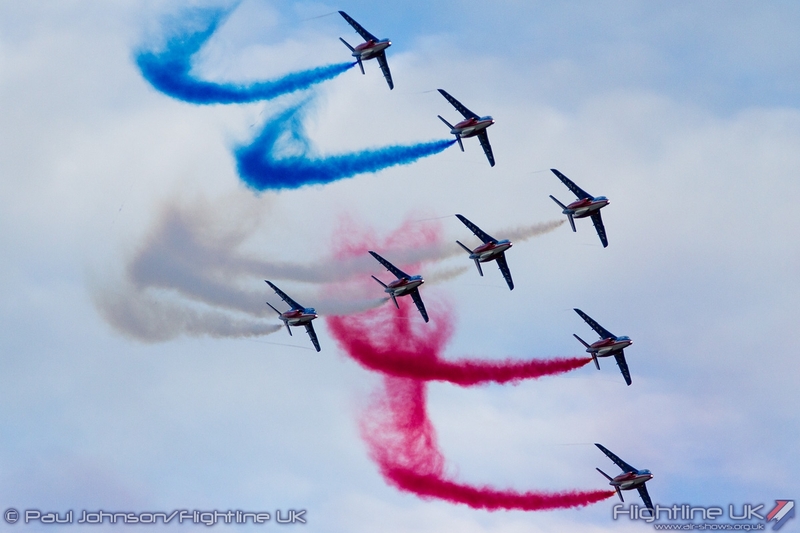 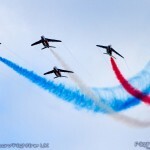 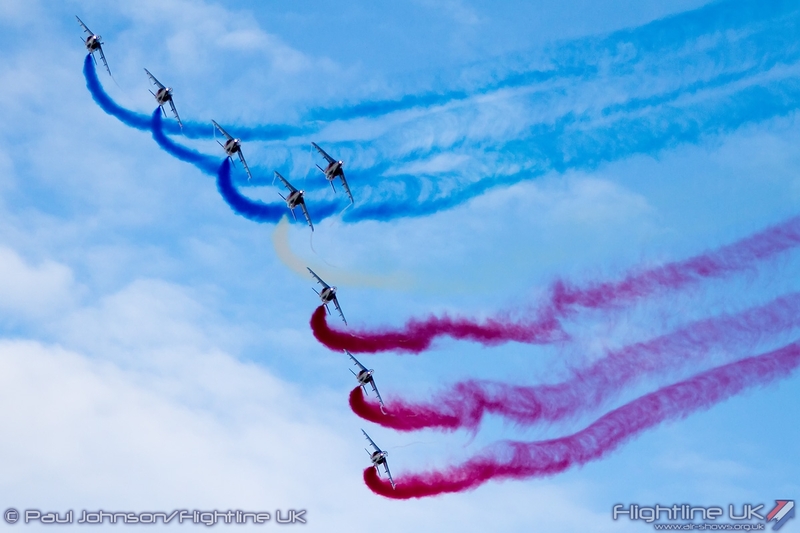 2015 saw the welcome return to the display calendar of the International Sanicole Airshow. 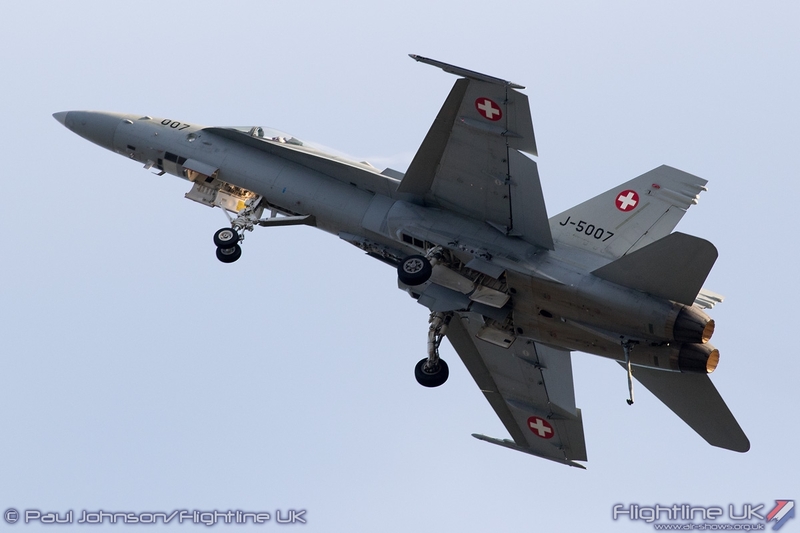 It took a year out in 2014 while nearby Kliene Brogel Air Base hosted the massive Belgian Air Force Days military event last September. 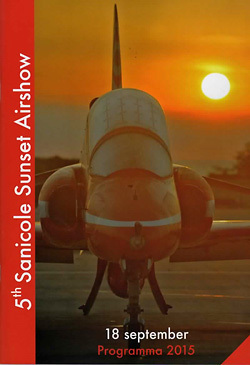 As is now tradition, Sanicole opened a full weekend of aviation activities with their 5th Sunset Airshow. 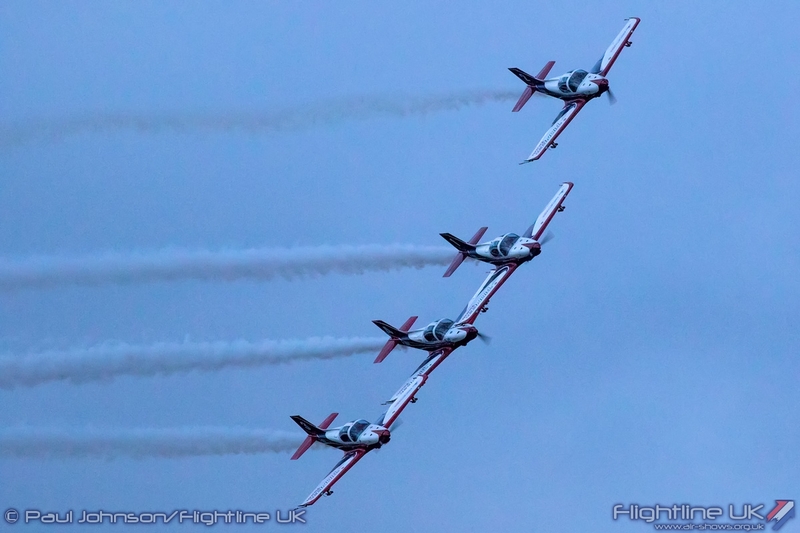 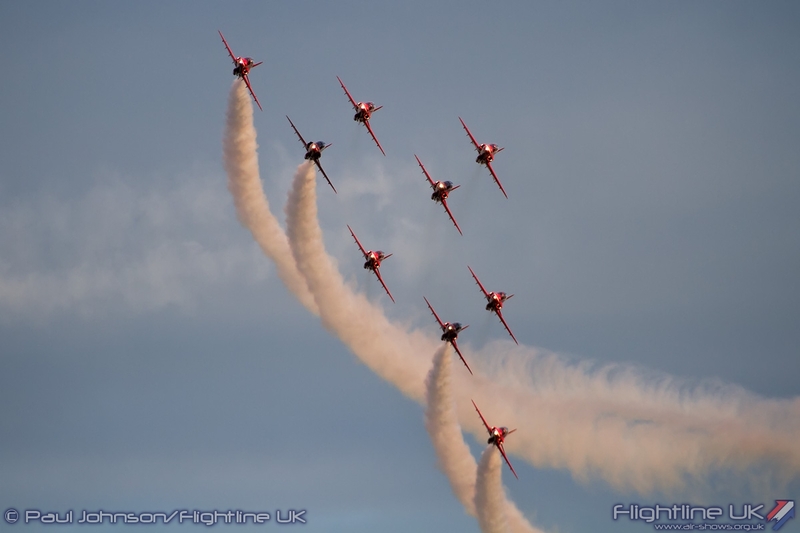 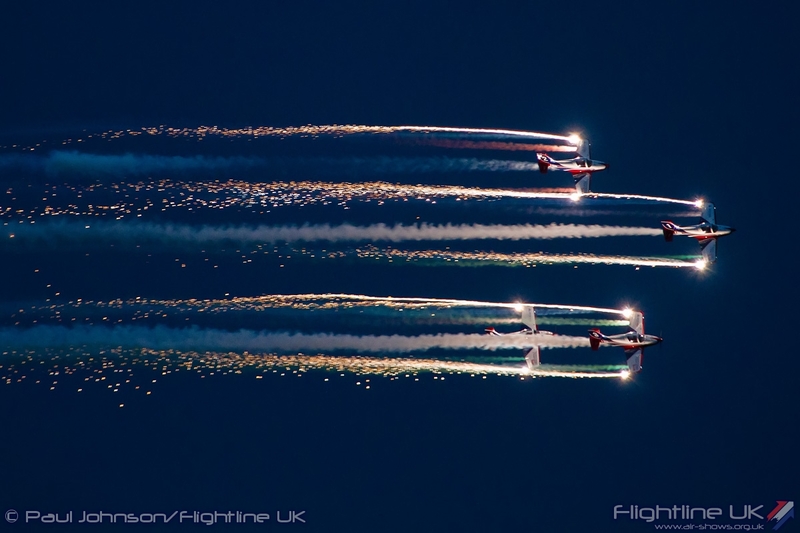 Drawing inspiration from the North American evening shows, the Sunset Airshow is an intimate affair with a short three hour flying display performed as the sun goes down and darkness starts to fall. 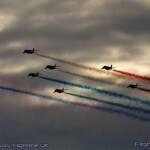 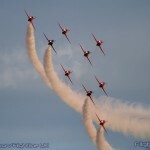 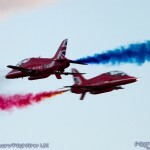 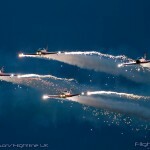 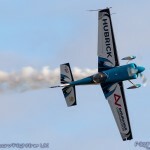 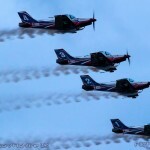 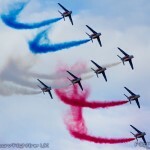 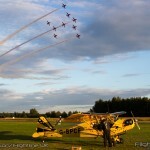 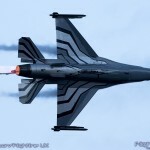 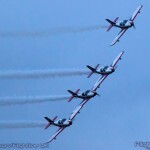 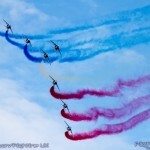 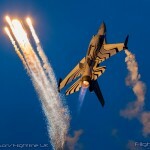 Since the very first Sanicole Sunset Airshow held in 2010, the event has proved to be a big hit with the Belgian crowds. 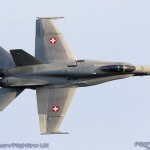 Like the main airshow held on the Sunday, the Sunset Airshow is an incredible mix of the very best military and civilian displays. 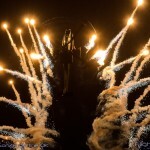 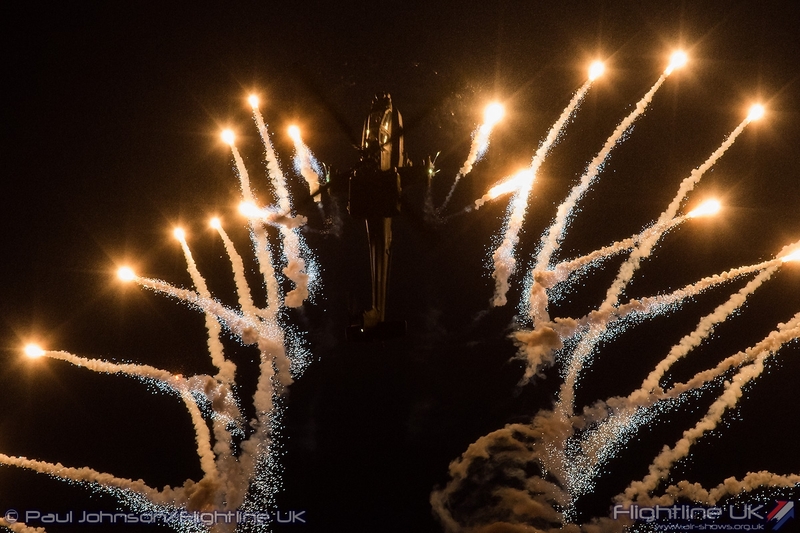 As darkness encroaches, the smoke trails and flares become more and more dramatic against dramatic cloudscapes before the show is closed by some of Europe’s specialist evening display acts using all manner of lighting and pyrotechnic effects. 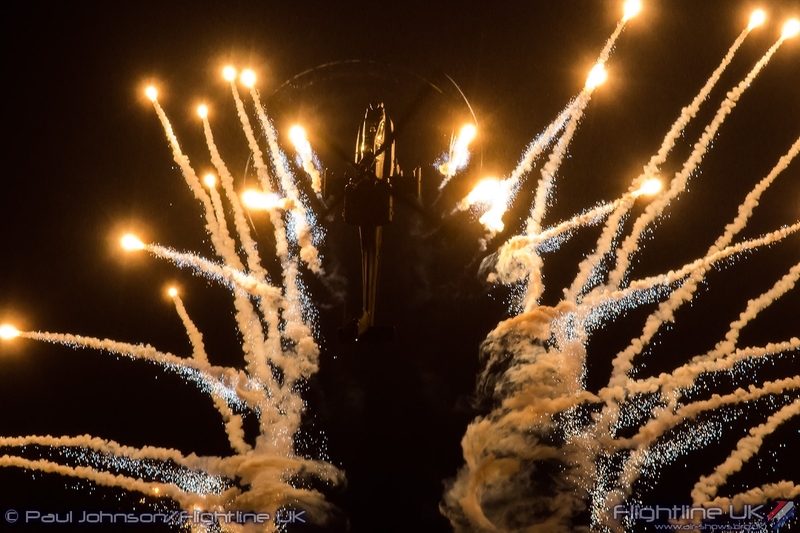 2015 was a very special year for Sanicole as it had attracted o less than four international military displays teams to the show. 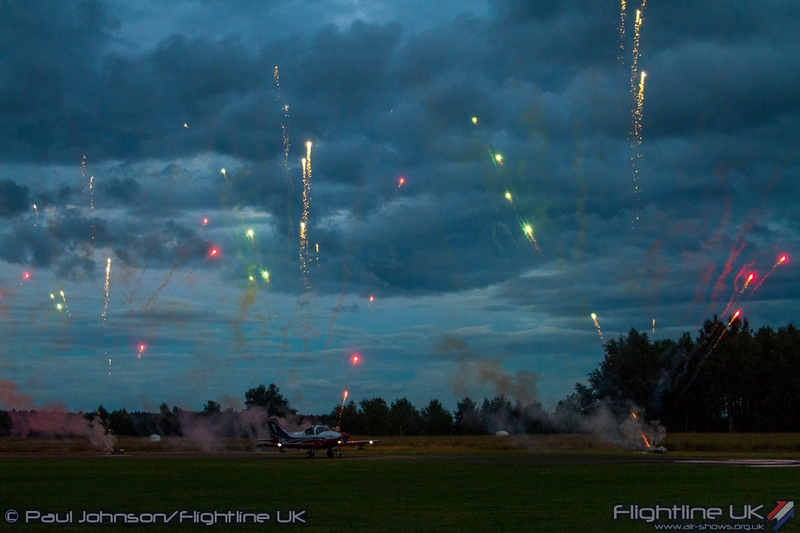 Not bad for what is essentially a civilian organised show held at a small aeroclub! 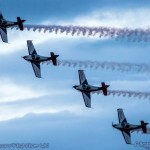 The Sunset show would see two of these teams fly their full routines for the small crowd. 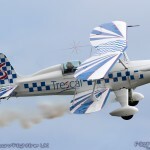 Opening the flying was the Stolp Starduster Too sponsored by Trescal. 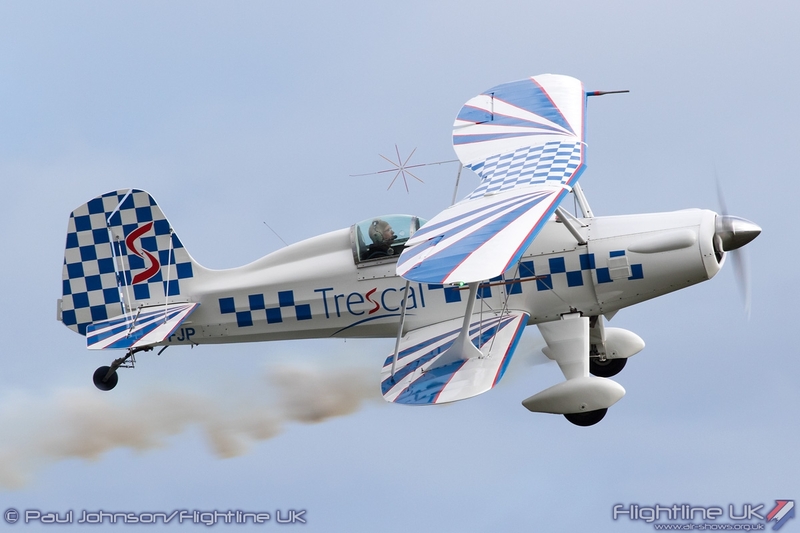 Flown by Jean-Marc d’Hulst, the Starduster is an attractive sports biplane capable of intermediate aerobatics. 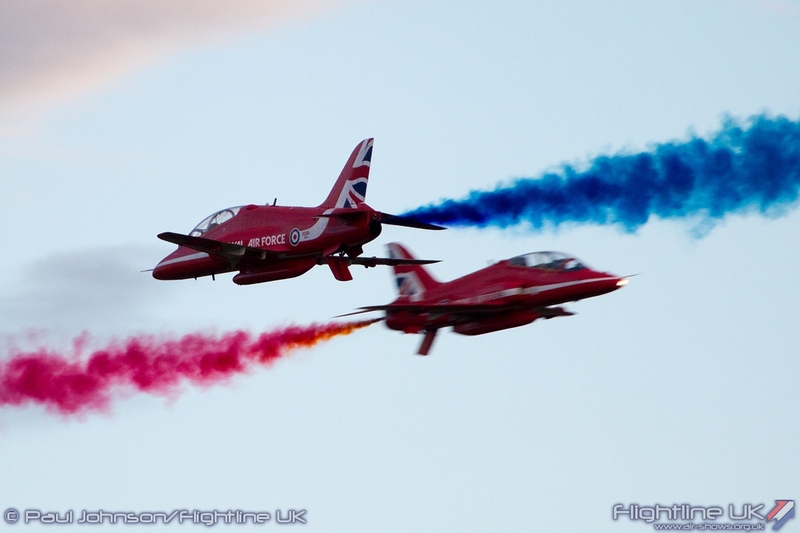 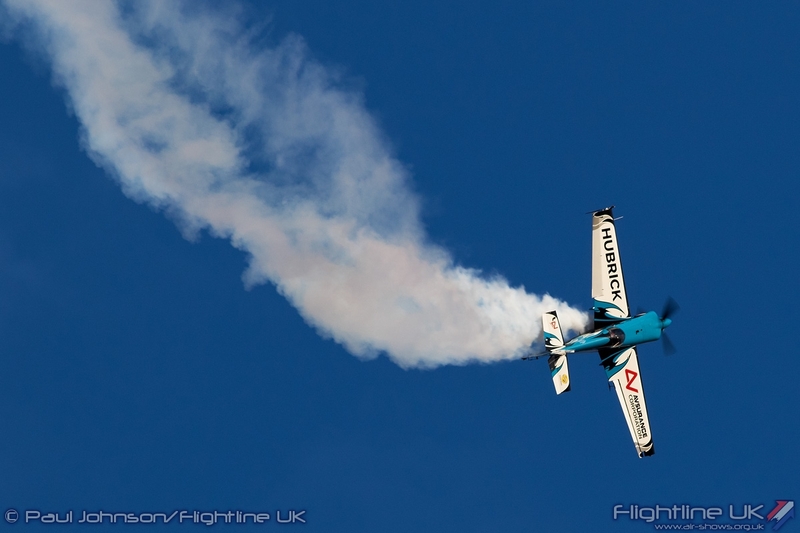 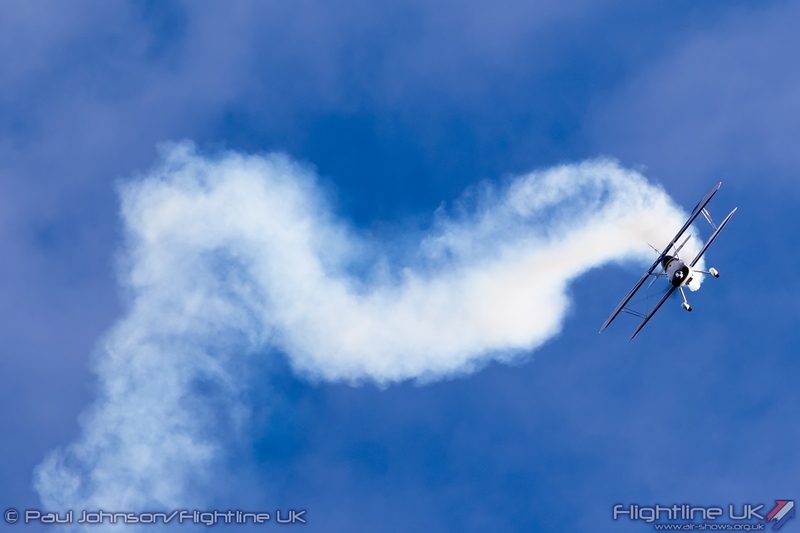 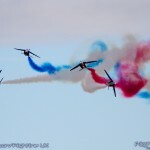 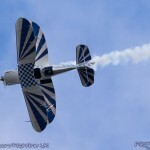 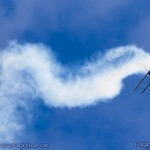 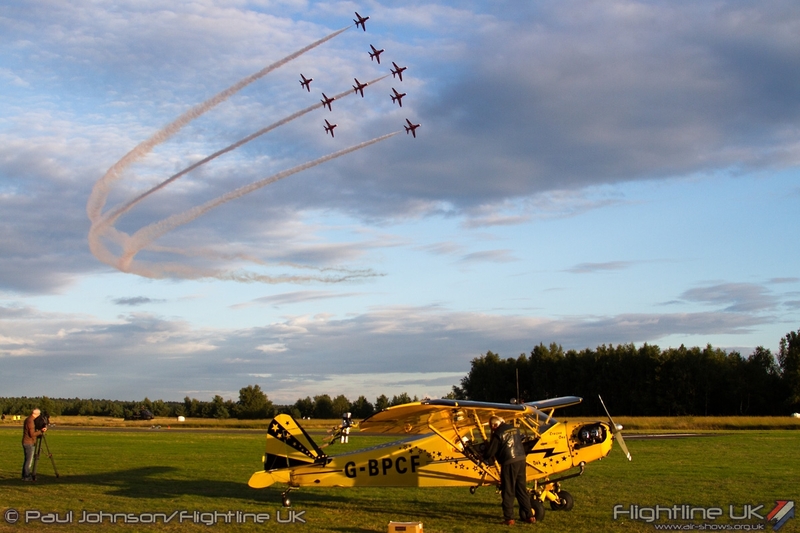 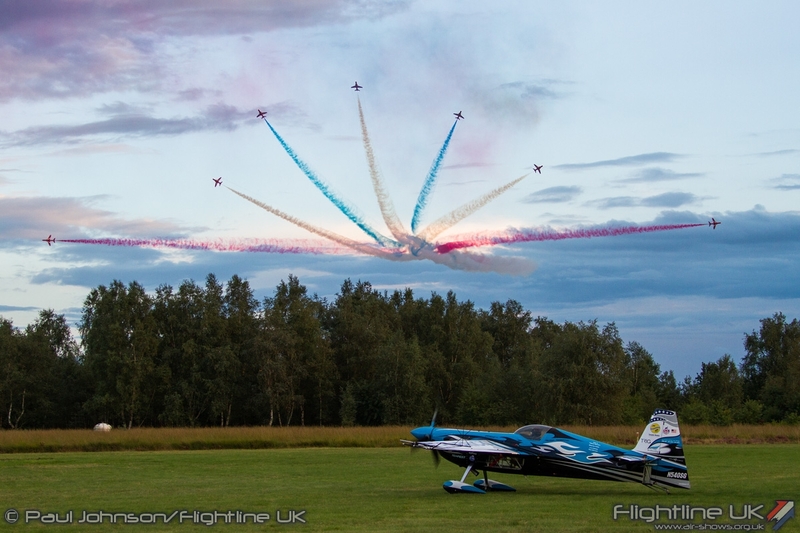 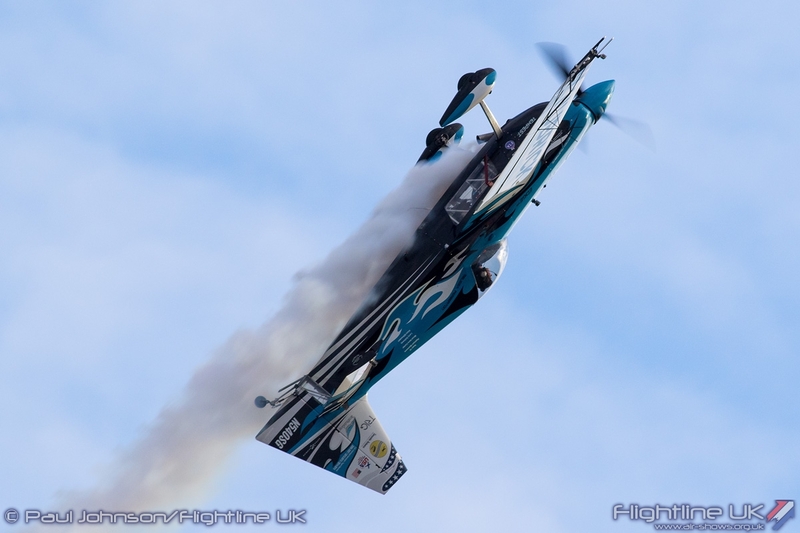 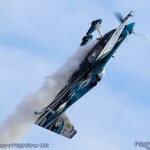 Jean-Marc’s display was a lovely flowing gentle display of aerobatics flown against the early evening blue skies. 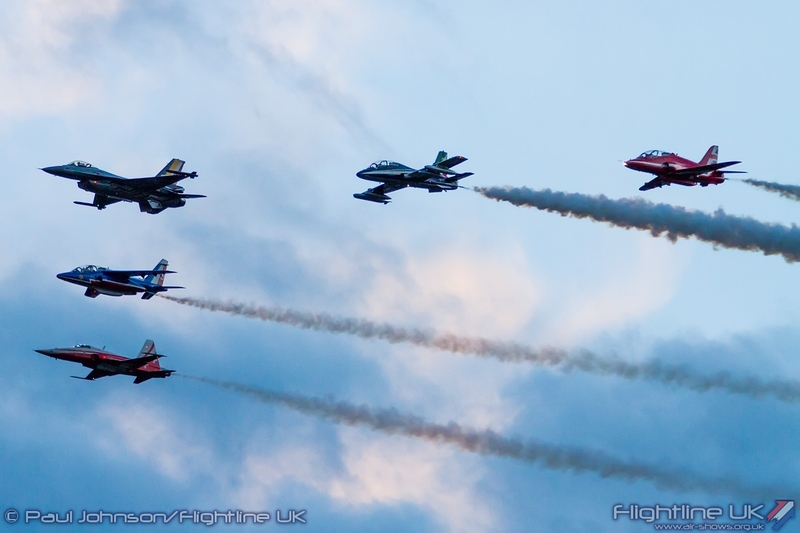 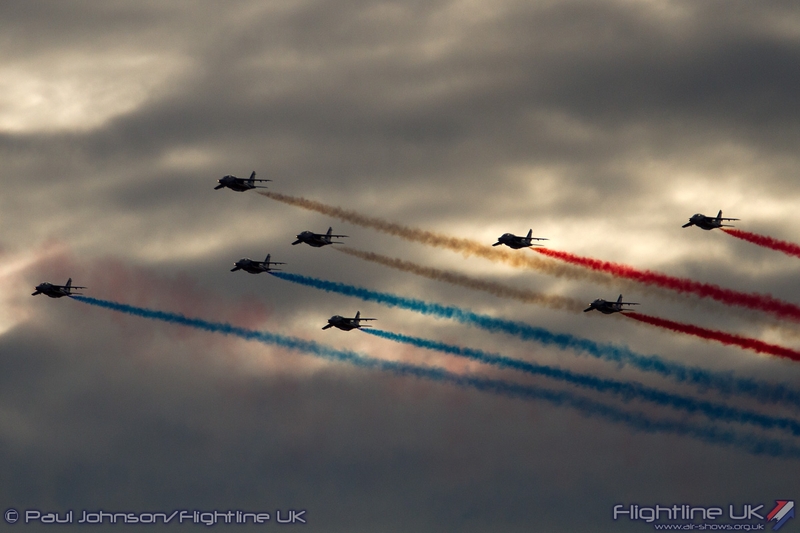 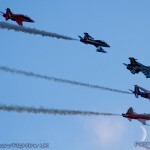 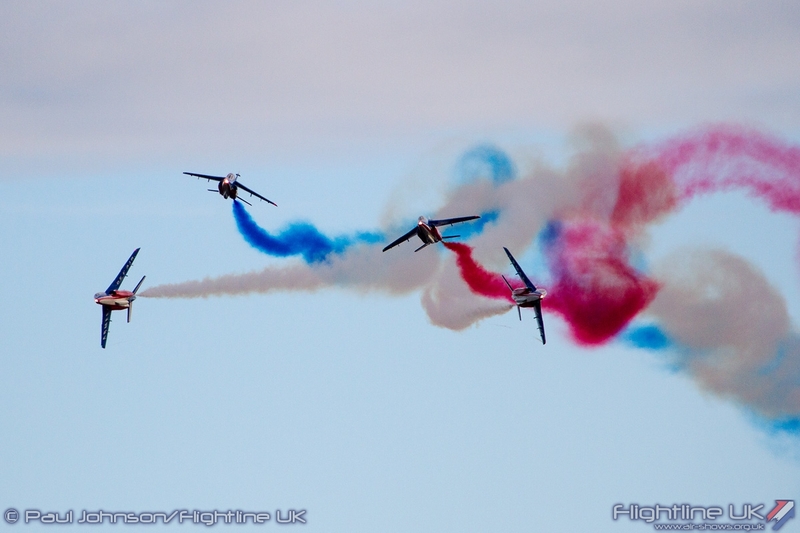 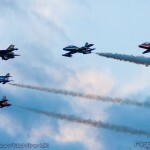 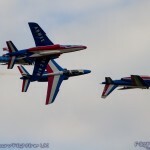 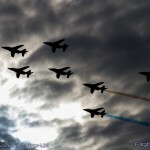 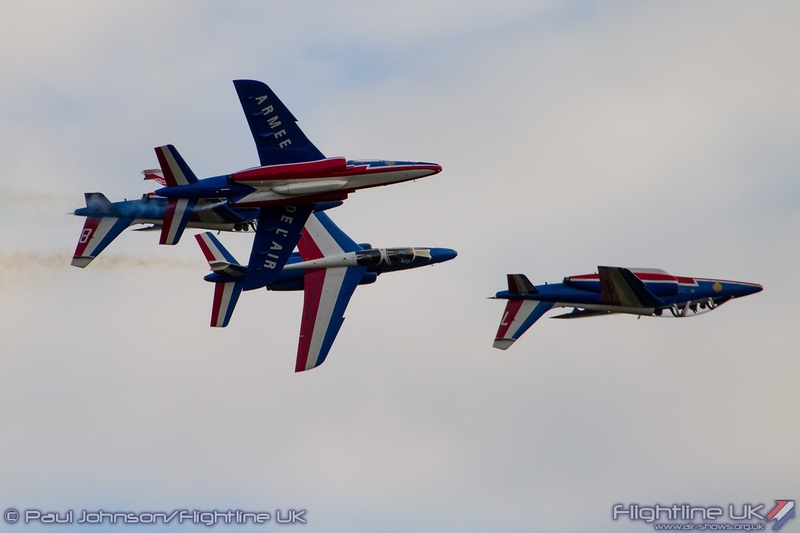 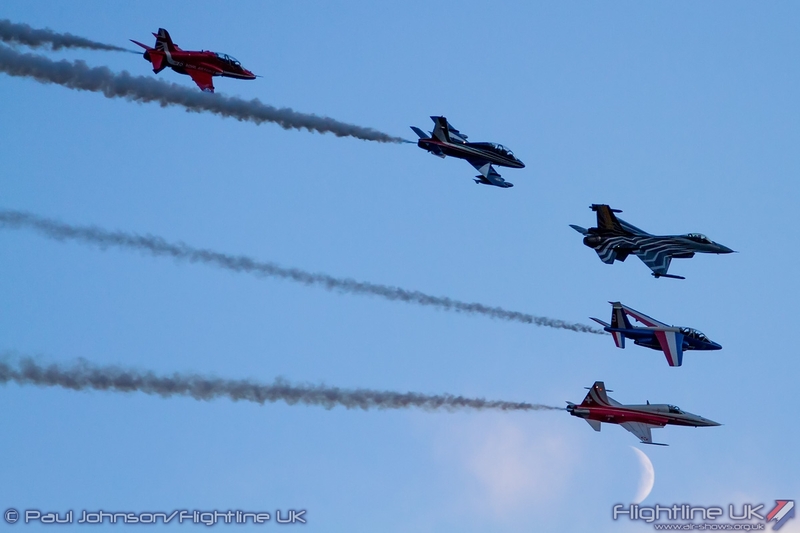 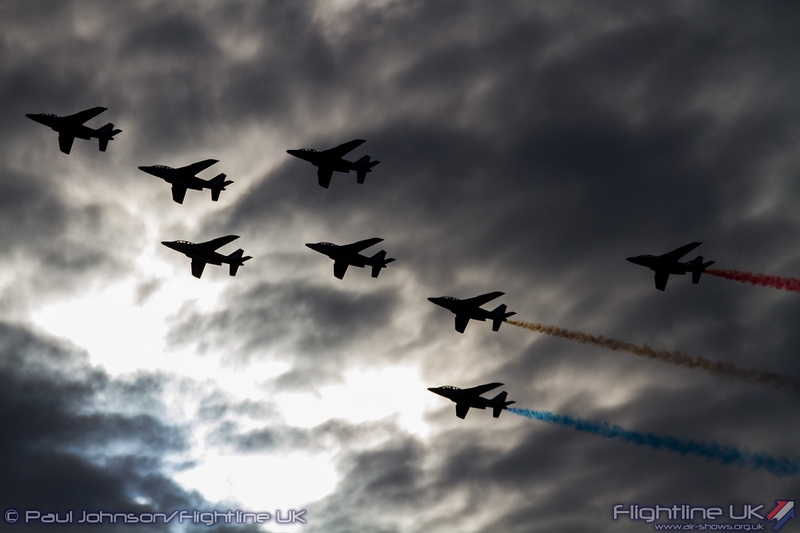 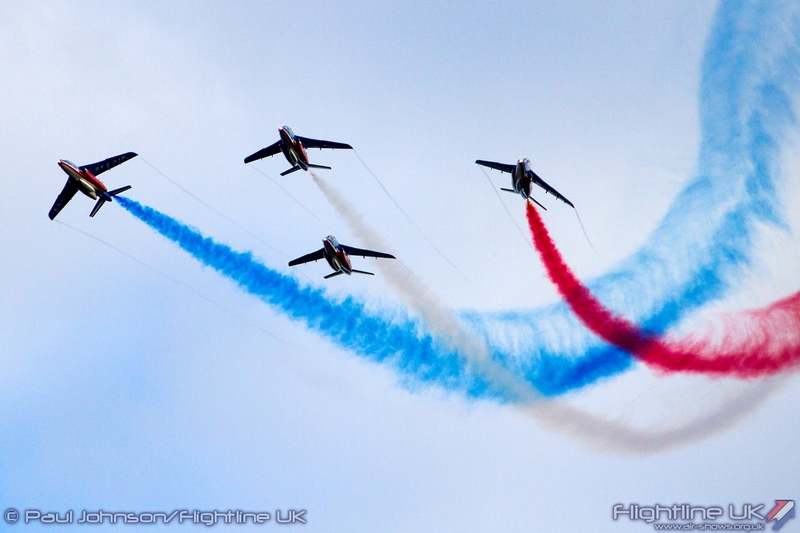 The French flavour of the evening was continued by La Patrouille de France with their eight Dassault Alpha Jet Es. 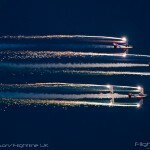 Like many national aerobatic teams, La Patrouille have an incredibly busy calendar which meant the Sunset show was the only chance to see them at Sanicole. 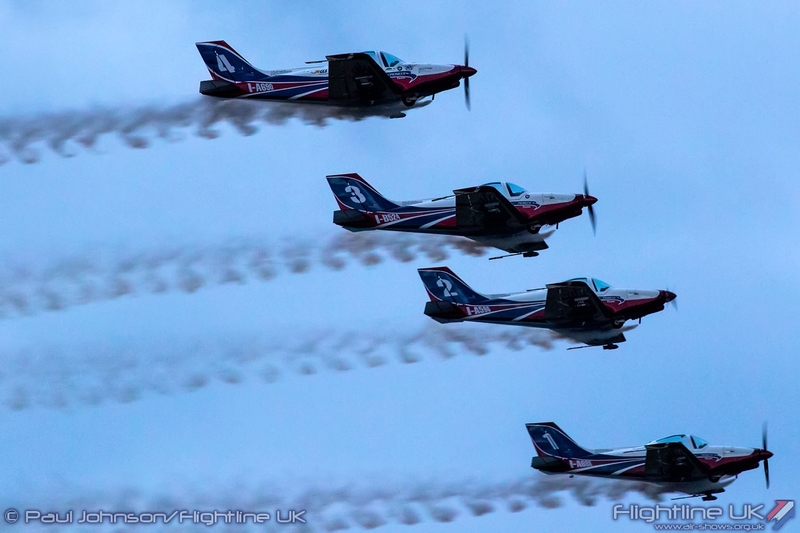 Compared to the other big teams, the Patrouille present a sweep and quite tight sequence of formation passes and synchronised aerobatics that looked superb against the dramatic evening skies. 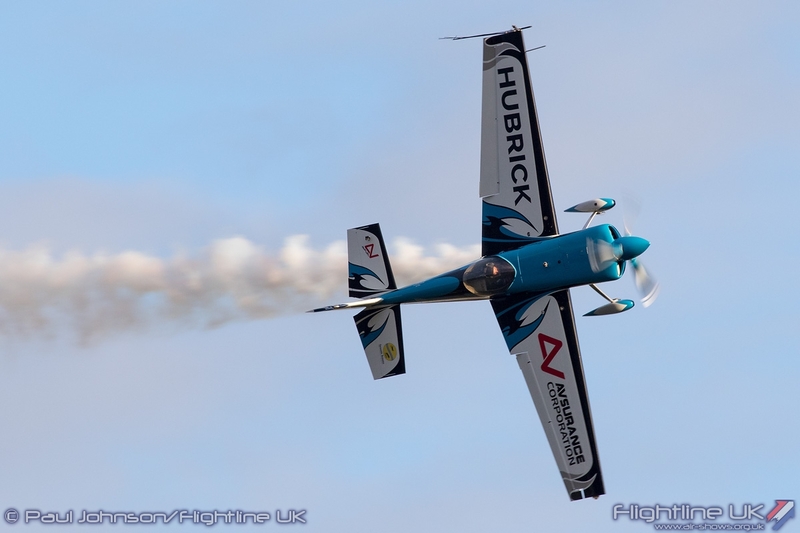 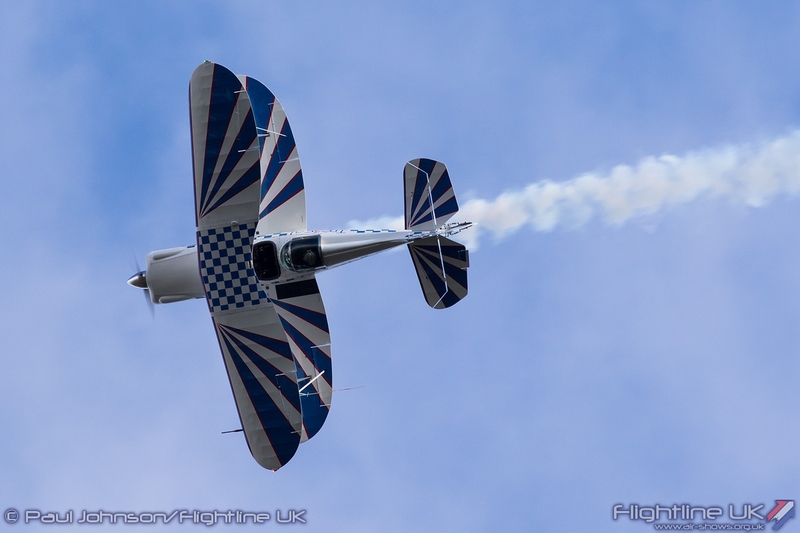 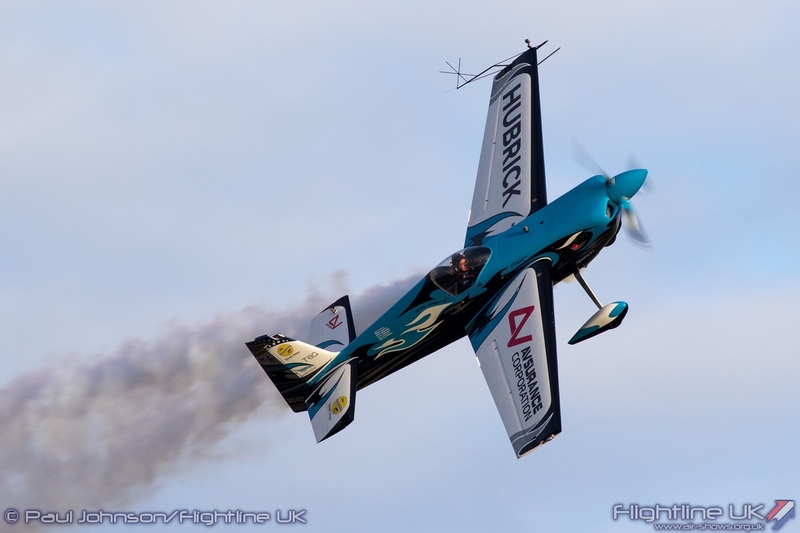 A further solo aerobatics display came from Melissa Pemberton in her Edge 540. 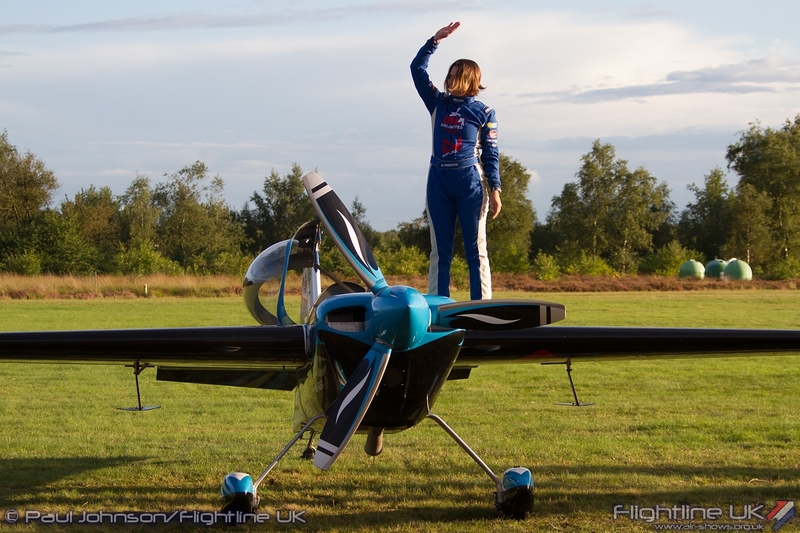 Melissa is no stranger to Sanicole but for the first time was display her own Zivko Edge 540. 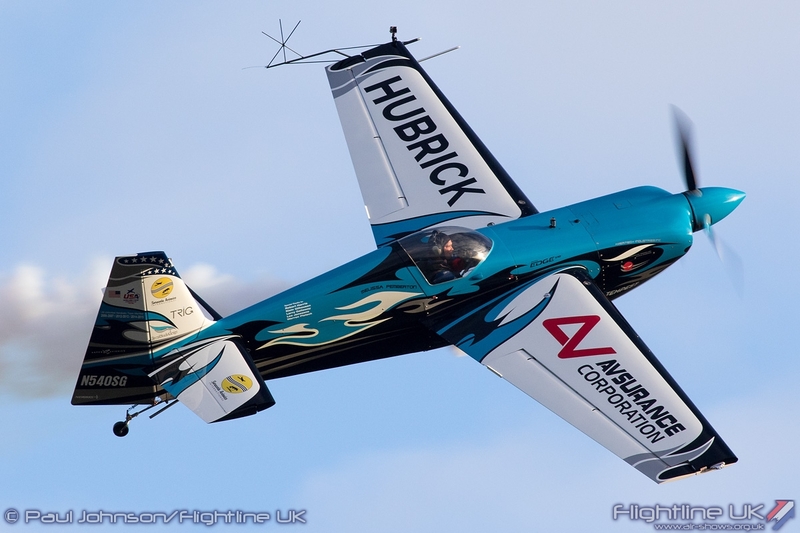 Along with the best aerobatic pilots in the world, Melissa was in Europe this year for the World Aerobatic Championship held in France. 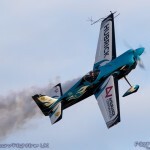 She is part of the US National team who came third overall and Melissa took third in the Women’s championship. 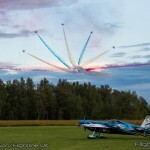 For the Sunset Show, she gave a very exciting solo freestyle display which certainly captivated the audience. 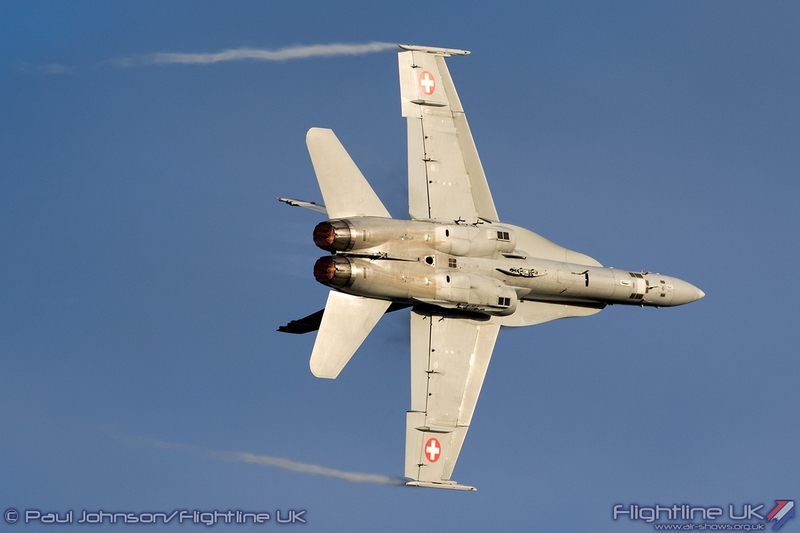 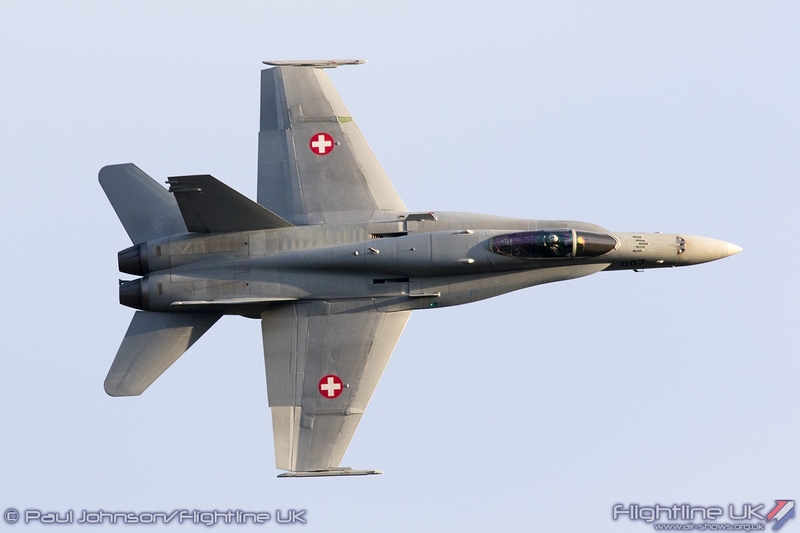 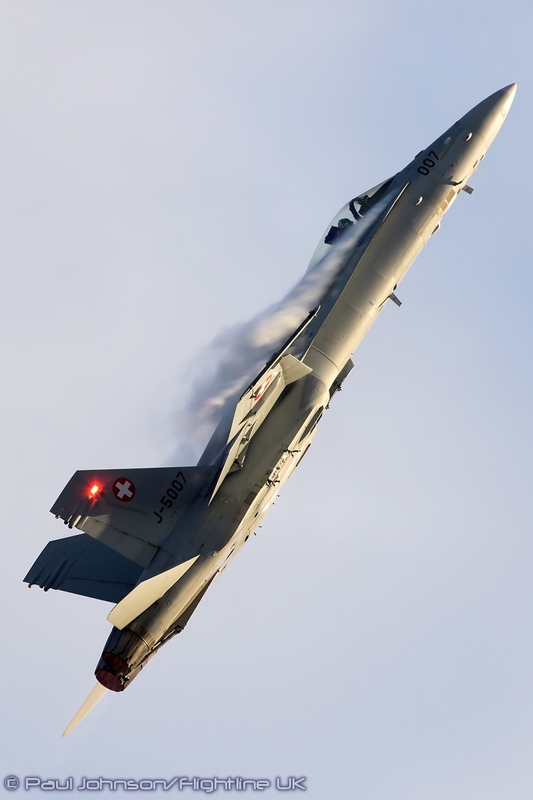 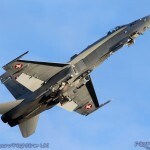 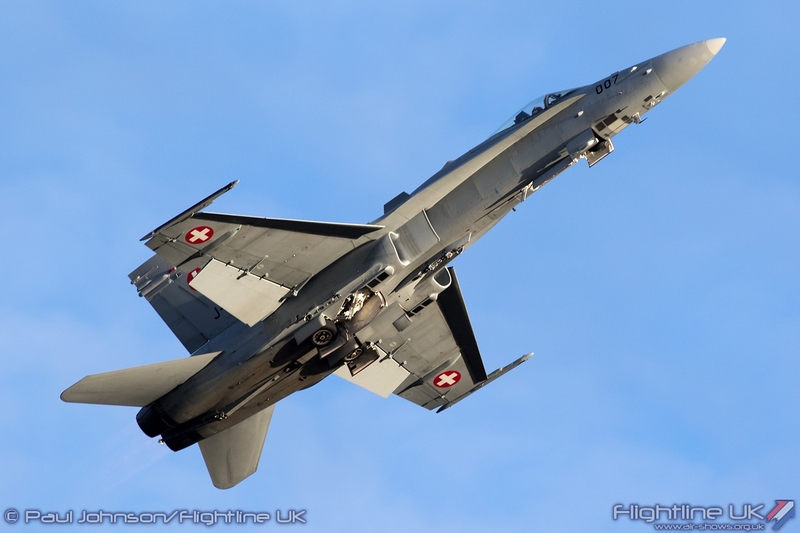 The sunset was just perfect for the Swiss Air Force McDonnell Douglas F/A-18C Hornet flown by Capt Julian ‘Teddy’ Meister. 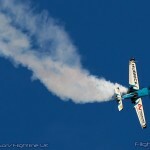 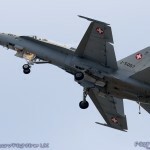 The cool evening air was great for vapour as ‘Teddy’ flew his noisy and punchy routine over the Belgian countryside. 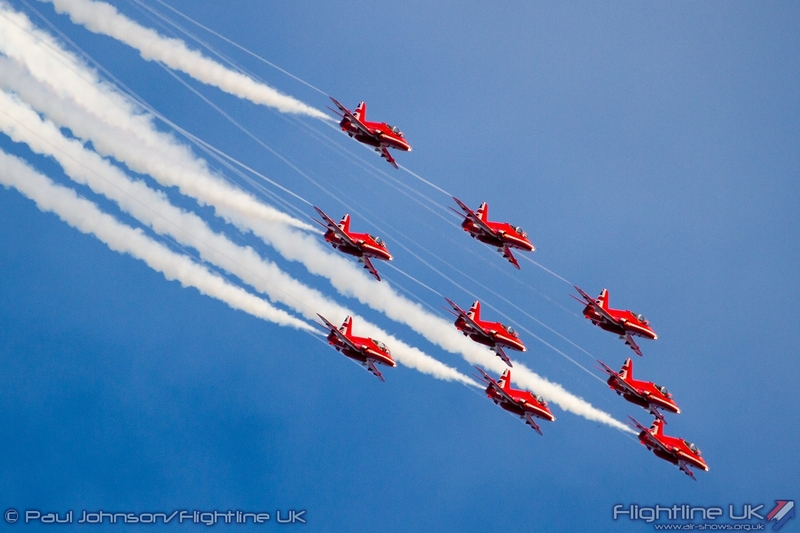 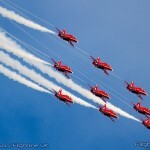 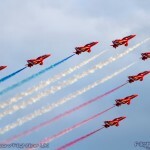 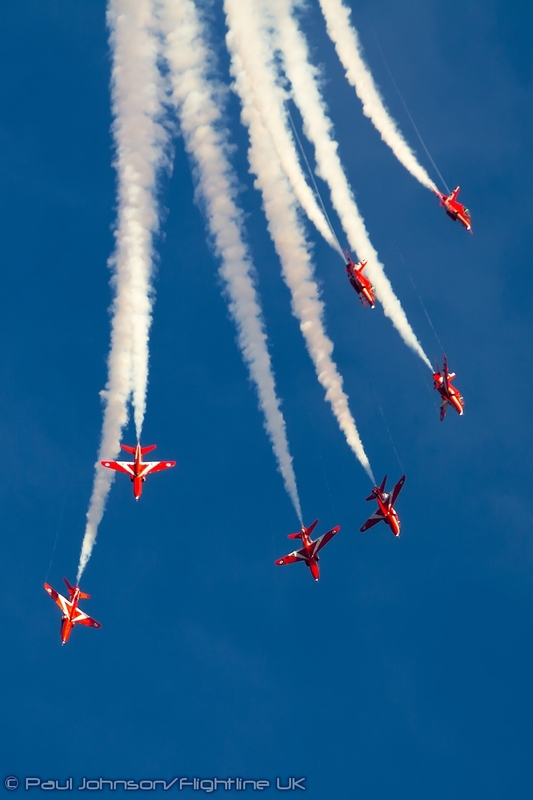 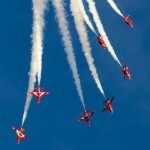 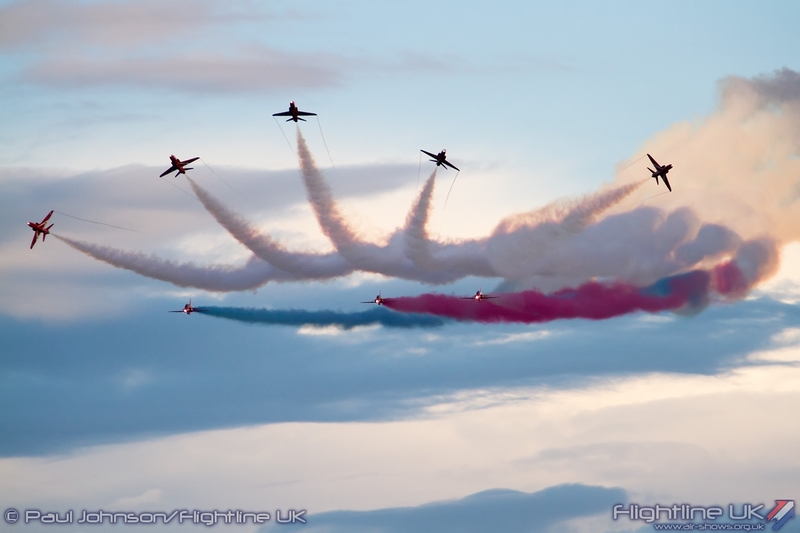 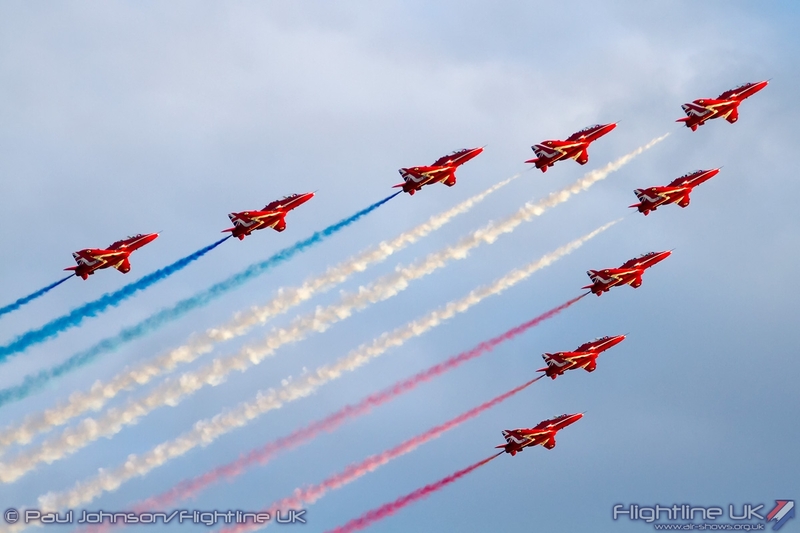 That lweather stayed good for most the Red Arrows display too. 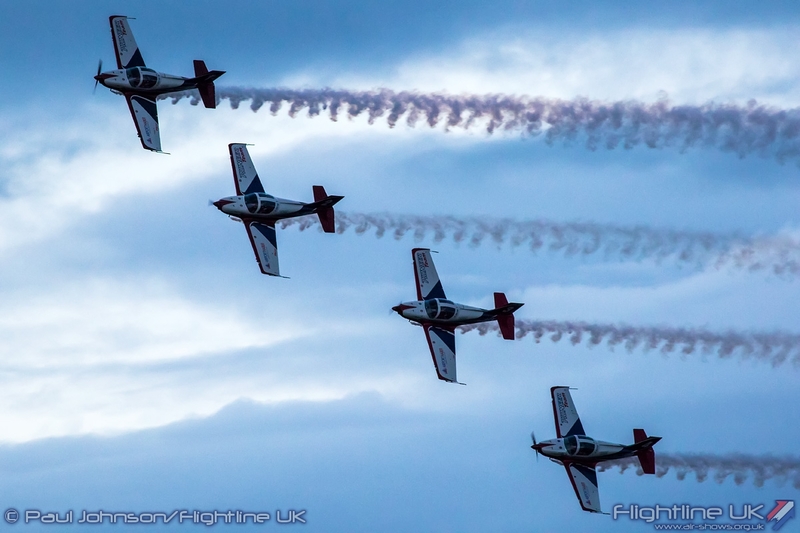 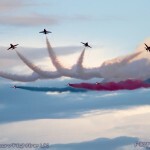 Like the Patrouille de France, their appearance at the Sunset was their only Sanicole display this year but it was one to savour as it is unusual to see an evening displays and the early evening light really highlights the aircraft and smoke trails so well. 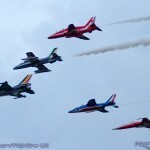 What then followed was one of the highlights of the entire weekend with a special formation of the Belgian Air Force F-16AM Fighting Falcon solo display aircraft leading the leaders of the Red Arrows, Patrouille de France, Patrouille Suisse and Il Frecce Tricolori for two passes along the Sanicole crowdline. 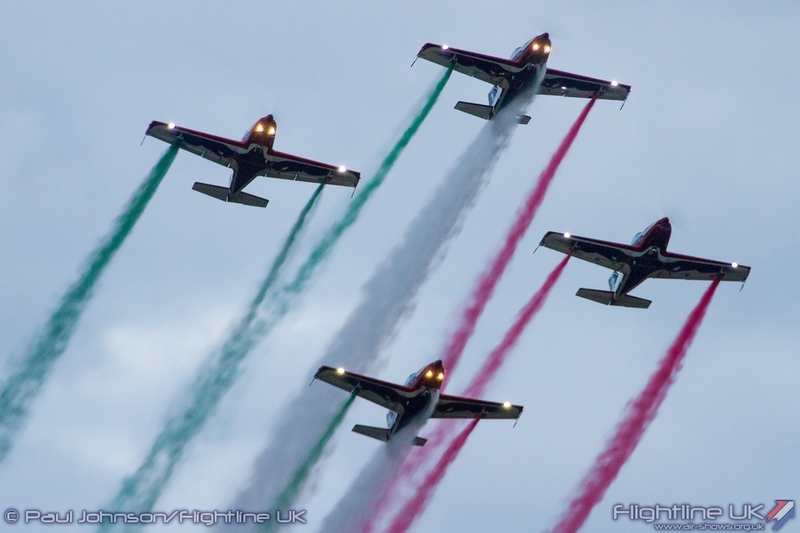 Such formations don’t happen often, and it is a credit to the International Sanicole Airshow organisation and the esteem the event is held in that such a formation was put together. 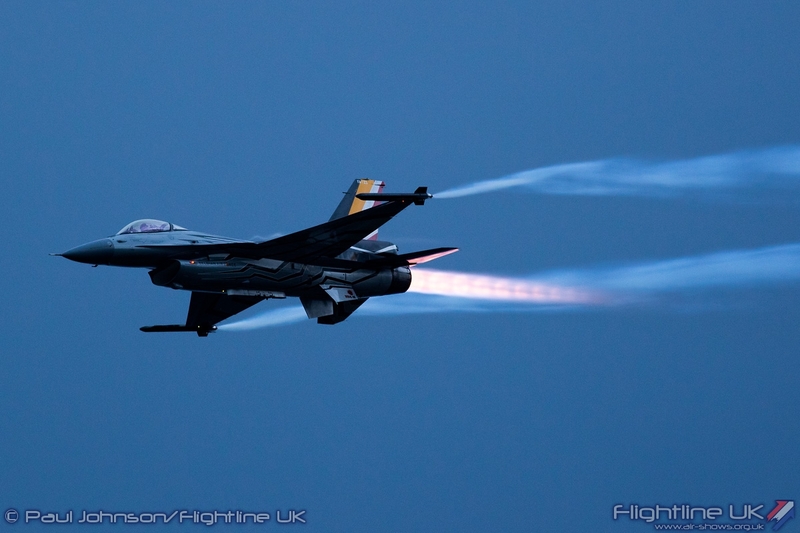 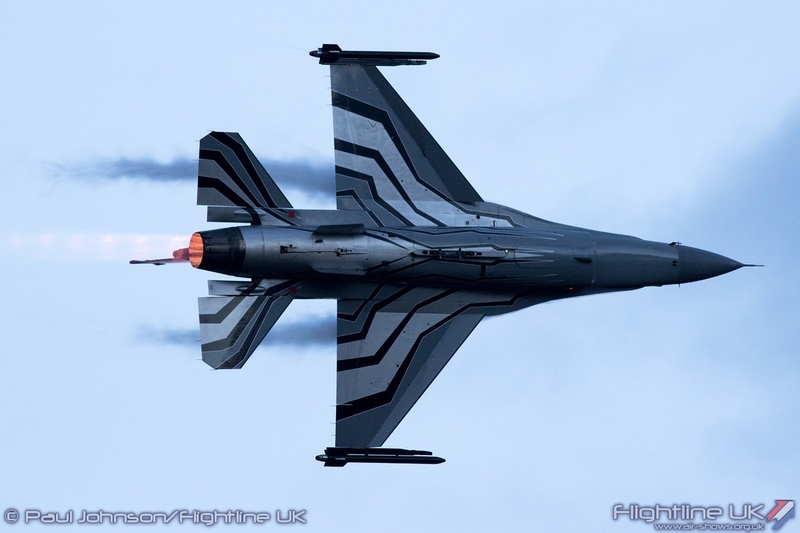 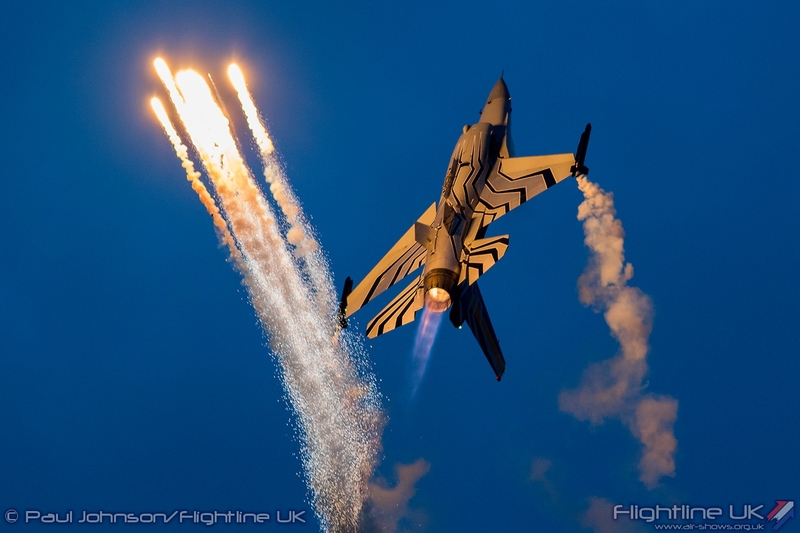 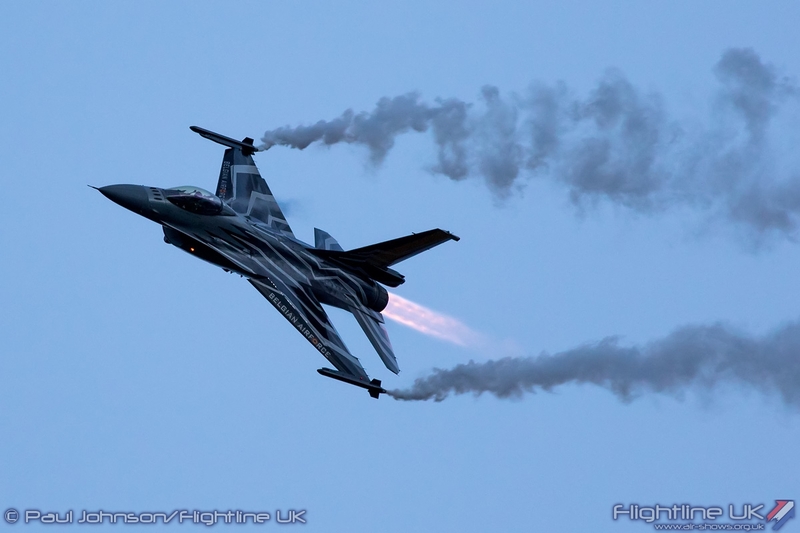 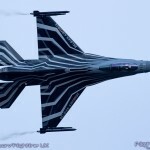 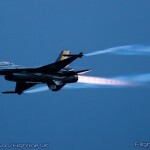 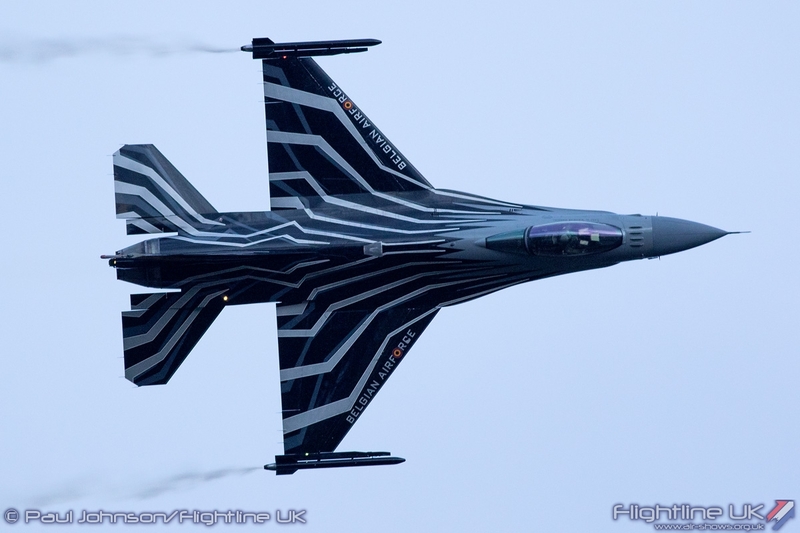 The Belgian F-16 was the first of the modern military aircraft to display within the true twilight with its reheat flame lighting up the dark blue sky. 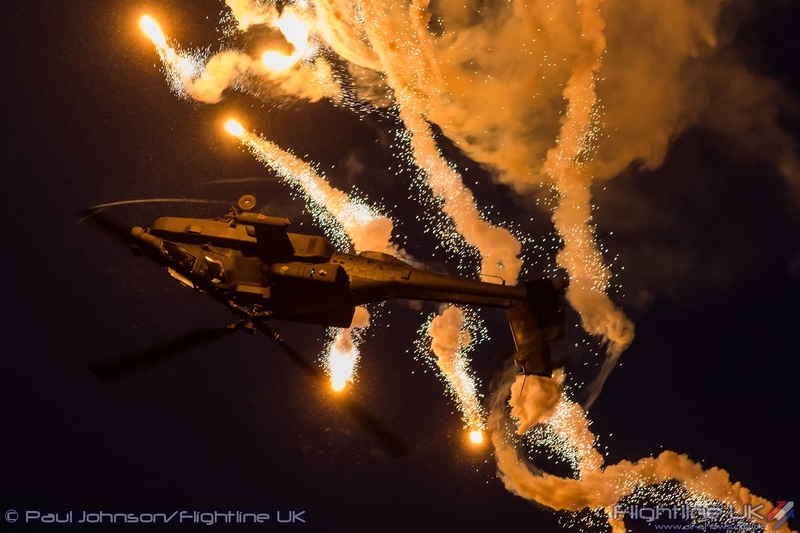 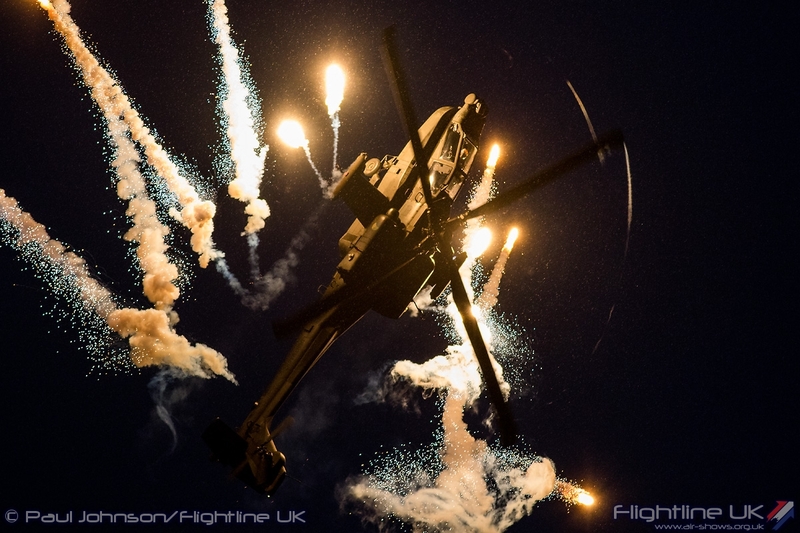 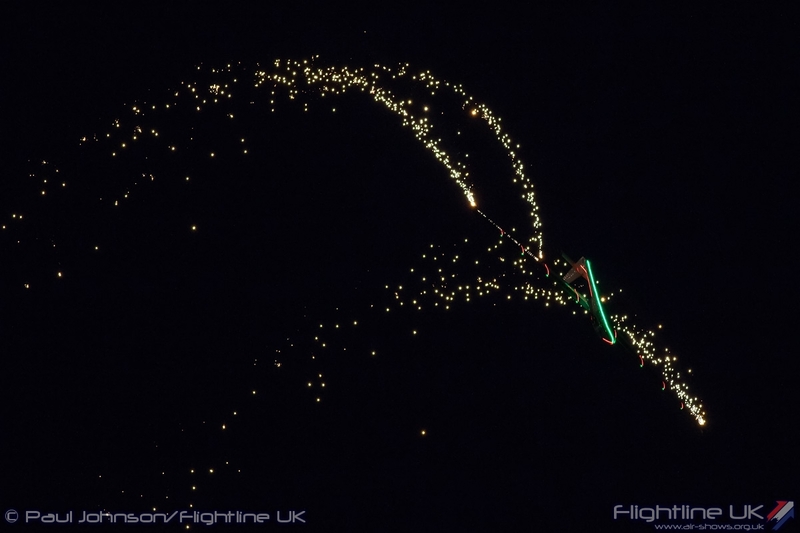 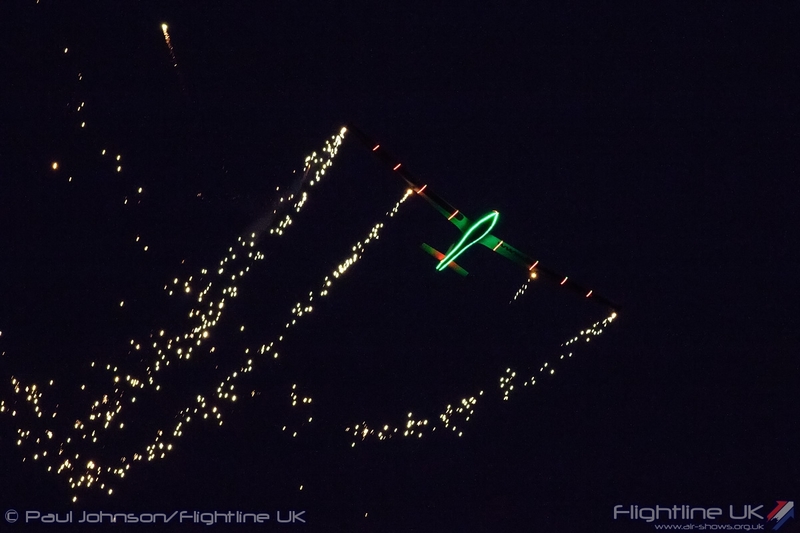 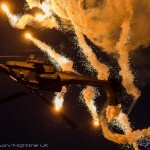 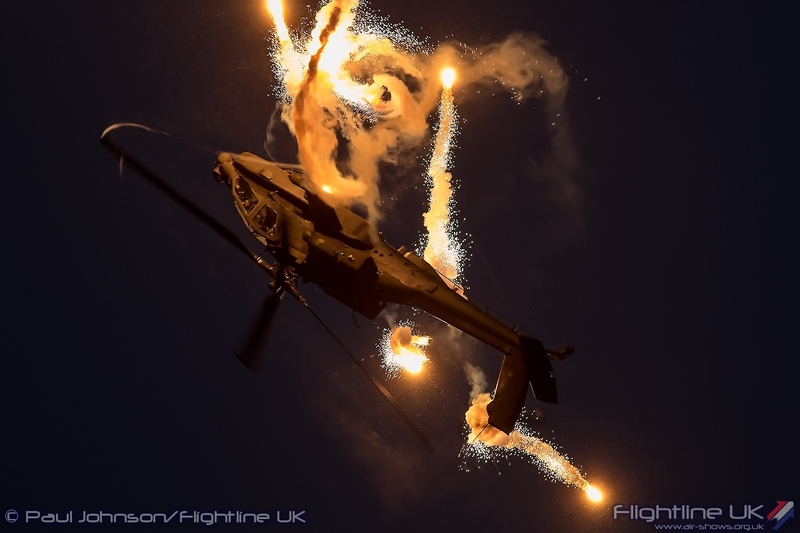 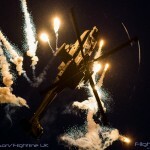 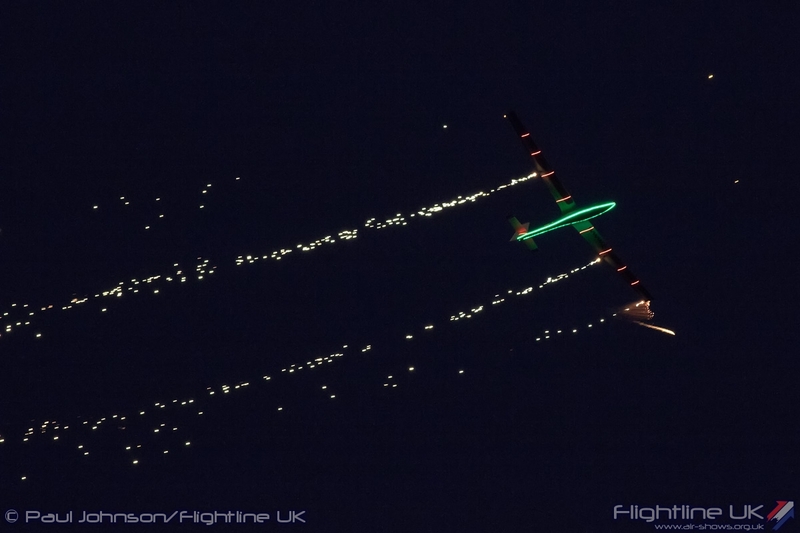 Flares too are much more spectacular in the low light, particularly when they illuminate the aircraft! 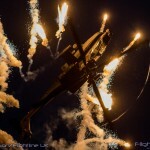 There was one more final modern military display of the evening was Royal Netherlands Air Force AH-64 Apache. 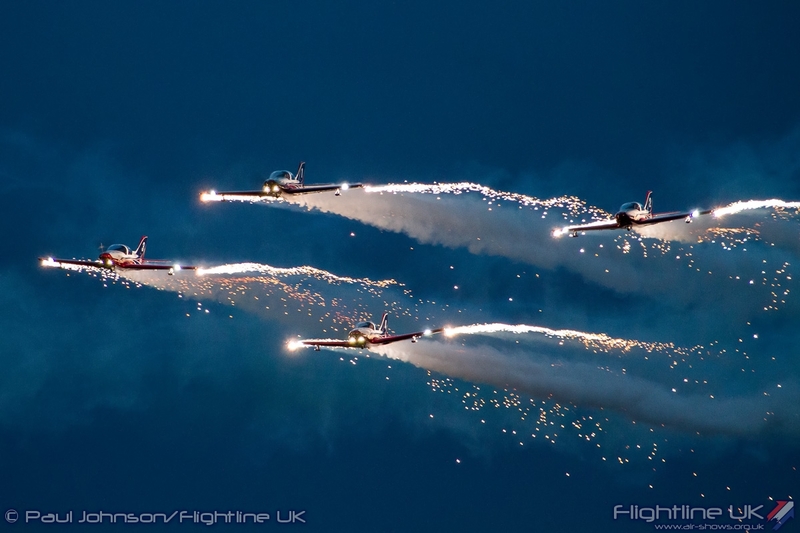 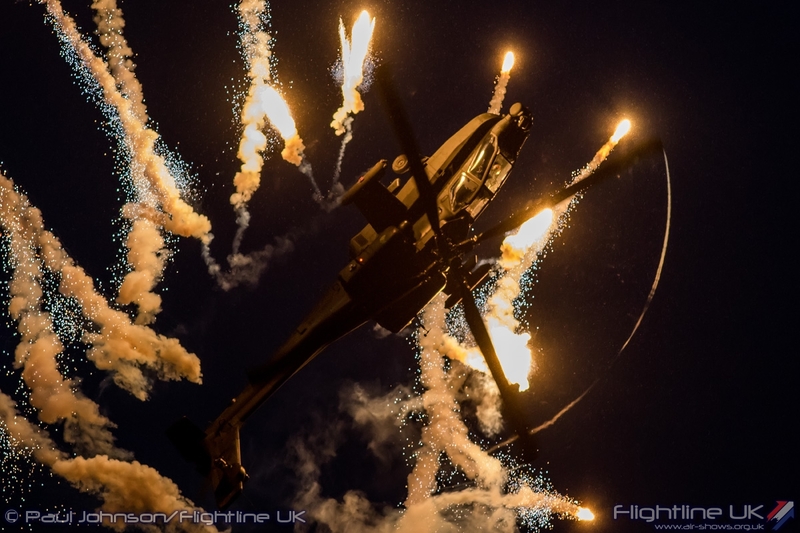 The crew made superb use of flares throughout their display fired over 120 of them as they flew their incredible aerobatic routine in the darkness. 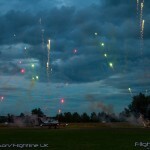 As they concluded their display, there was a short fireworks display. 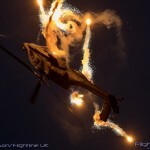 he final few display items were all civilian displays that make full use of pyrotechnics and special lighting on their aircraft for twilight displays. 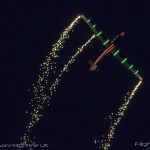 Sadly Brendan O’Brien suffered an electrical snag during his display, but there were two other great displays. 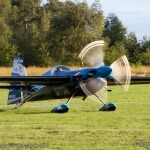 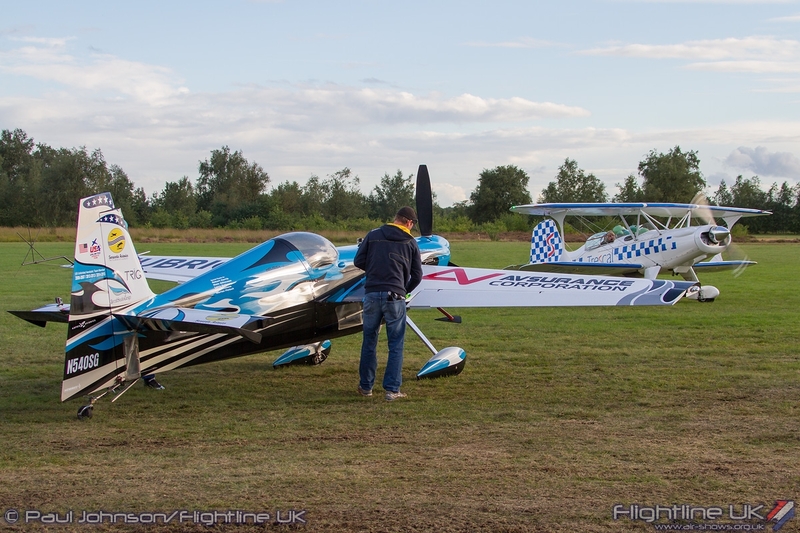 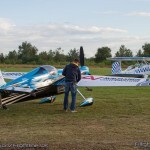 Johan Gustafsson is a champion glider aerobatic pilot from Sweden. 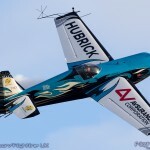 He made his Sanicole debut on during the Sunset Airshow flying his modified SDZ-59 Acro glider. 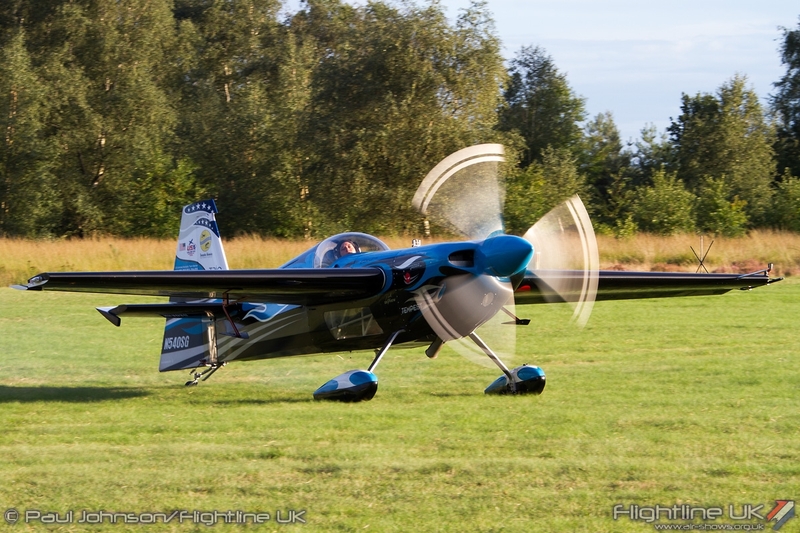 Designed in Poland, the SDZ-59 is one of few gliders designed for aerobatics. 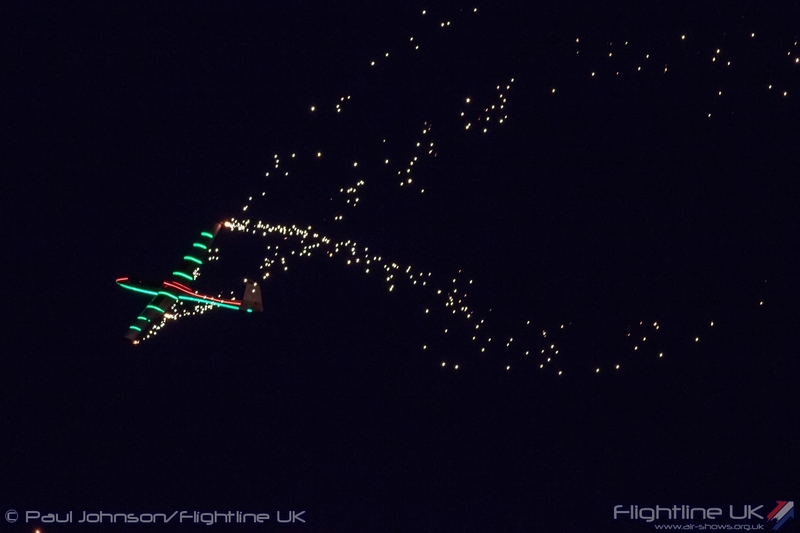 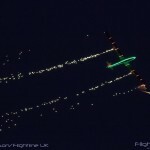 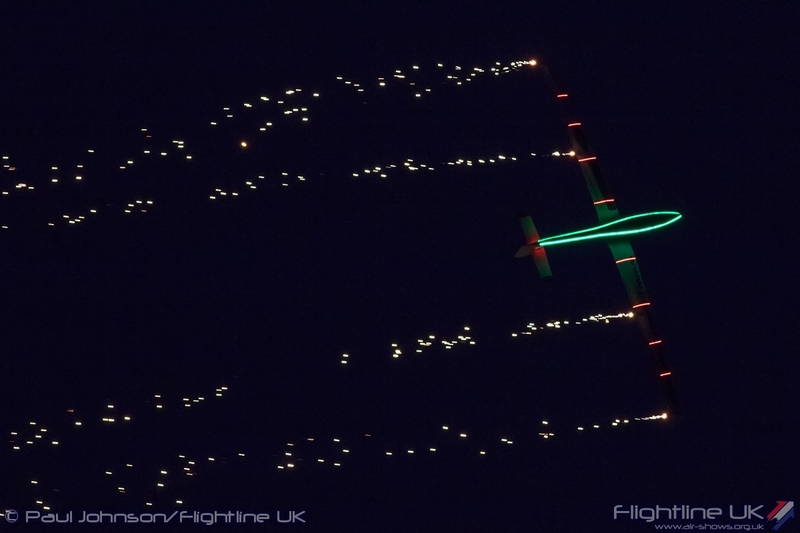 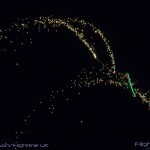 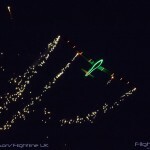 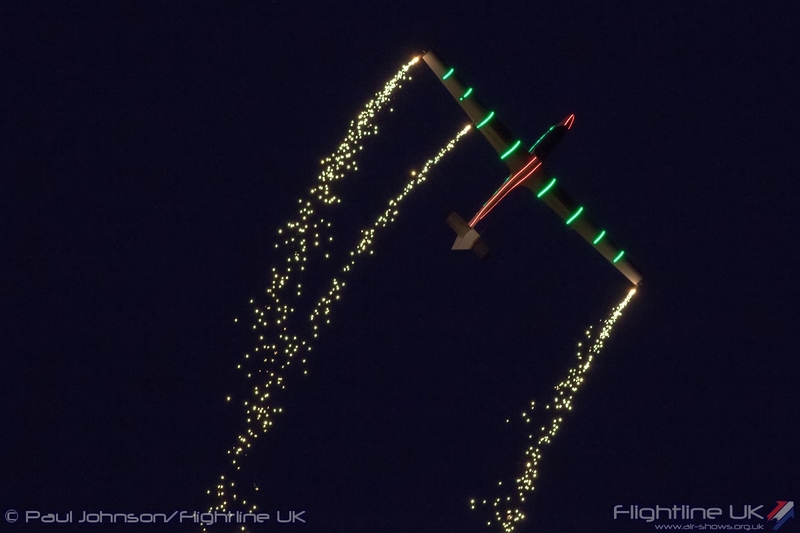 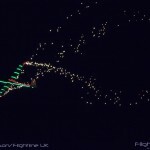 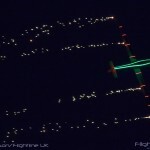 Johan has fitted his glider with a number of LED strips and the ability to fire pyrotechnics for his night-time shows. 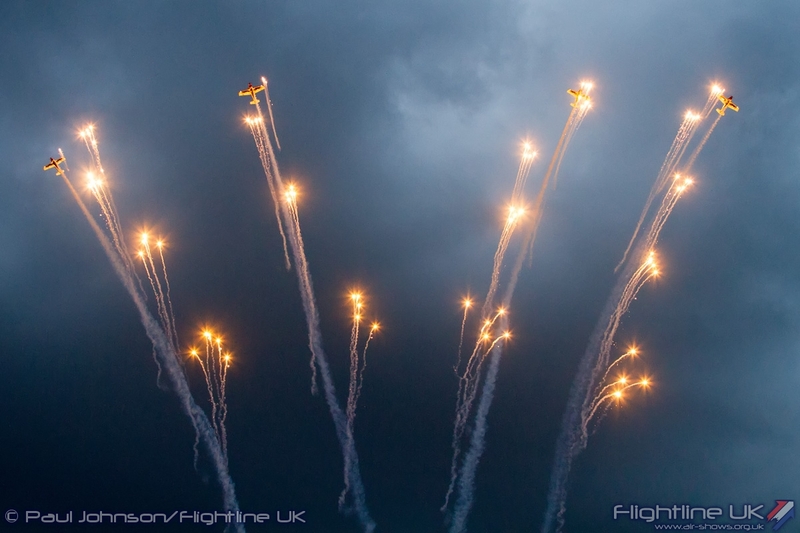 Despite the gloom, John performed a full aerobatic sequence with sparks trailing from his wings which provided a very elegant end to the flying. 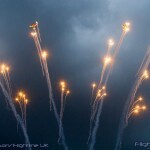 The Sanicole Sunset Show was once again a stunning event that failed to dampened by some periods of light rain or a couple of cancellations. 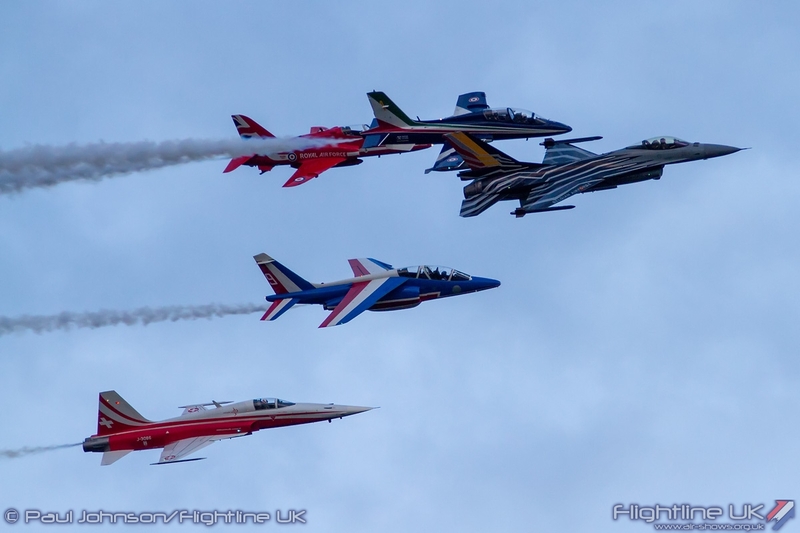 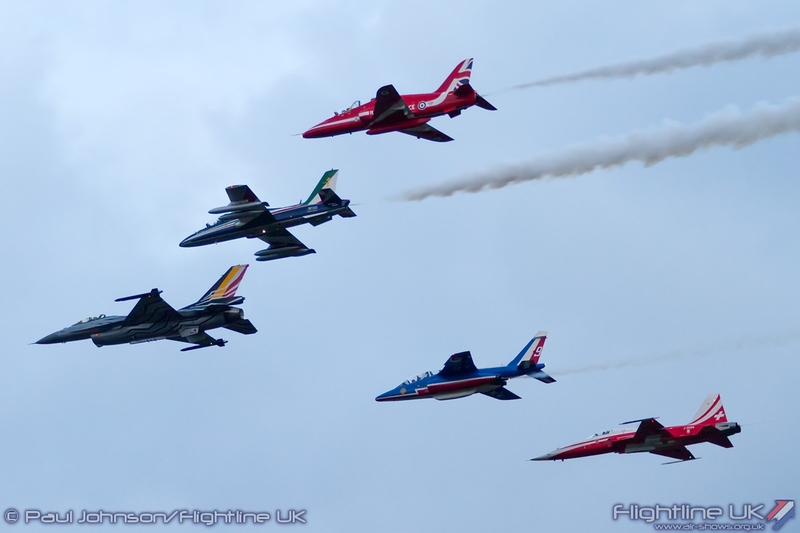 Any airshow would be very proud of the varied line-up presented and it is a very special way to open a weekend of aviation entertainment in Belgium.